It was 4pm and I was staying late in the office after work to do a radio interview about the humanitarian situation in Yemen. During the interview my phone was on silent, and when it finished I turned it over to see many missed calls and a message telling me that an airstrike had hit next to my house. The most terrifying part of that moment was thinking I might be about to hear the news that I’d lost one of my parents or siblings. I thought that maybe my family would become just another of the many miserable stories of war that the world, from where we sit here in Yemen, just doesn’t seem to care about. Countless thousands of people have died since the conflict began in March 2015, and though the deaths were due to many different reasons, war was at the heart of all of them. This is exactly what I heard when I visited Altahseen camp for internally displaced people in Amran governorate last month. This camp holds more than a hundred families who fled their homes in Hodeidah due to the ongoing fighting, and I was there to take photos reflecting their situation. While I was trying to do my job, a fight broke out between women who were jostling to fill their jerrycans with water. I immediately stopped taking photos, wanting to respect their dignity. I left the camp thinking how desperate people have become and how exhausted they are after almost four years of war. It is horrific to think how many people have fallen into the dark abyss of an unknown destiny. Up to 14 million Yemeni people are now said to be at risk of famine – an increase of almost 6 million in the past year. When I came across this information I couldn’t help but wonder, how many of the previous number are still managing to survive, and how many have been slowly dying? And who is the child breathing his or her last breaths as I am writing this, or while you are reading it? Imagine living in a small tent that the cold wind rips straight through. No food, no clothes, and nothing to provide to your seven-member family. Every day you need to collect cartons from the garbage to burn in front of your tent to warm it up. You sit with your kids around the fire, trying to fight the cold winter with empty stomachs. You look at the backs of your children. You can clearly see their hair colour fading and their little bones drawn in detail against their soft skin due to malnutrition. At that moment, you realise how helpless you are, and the only question is who will die first and who will survive. With zero exaggeration, this is how desperate people are. And when you travel to the field, each and every time will consistently shock you as if it were the first time. There are endless stories which leave so much pain. It hurts each time you remember the way someone was telling you their story, expecting you would be able to help them. But the longer this war continues, the more vulnerable people become, and as their numbers keep increasing it is more and more difficult for NGOs to respond. That is why peace is so urgently needed. Looking back at the photos I took of my home after the airstrike and from my field trip to the camp, I realised something: that the war in Yemen offers two different ways to end your life. The first is to be at home in good health with your loved ones, killed quickly by an airstrike or an attack. The second is to watch your entire family die slowly of hunger in a small tent far away from your home. And as time goes on, you become more accepting of the idea of death and of the two paths to death that have become part of life in this war. This is what we are living in Yemen, whether you are a humanitarian aid worker or a beneficiary of humanitarian aid. 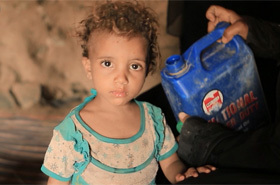 In the poorest country of the Arabian peninsula we are all victims of conflict, hunger and disease. It is time for the rest of the world to sit up and pay attention to Yemen. Abdulhakim Al-Ansi is CARE Yemen’s Communications Officer based in the Yemeni capital Sana’a.